Israeli Prime Minister meets UN Secretary-General in New York, urges UN to take action on Israelis held captive by Hamas terror group. Israeli Prime Minister Binyamin Netanyahu urged the United Nations to request that the international nuclear watchdog group check the information Netanyahu provided regarding Iran’s nuclear program during his United Nations General Assembly address Thursday, and to inspect sites in Iran which Israel claims are used to store nuclear material. Netanyahu met with United Nations Secretary-General Antonio Guterres at the UN Building in New York City Thursday night, and urged him to request that IAEA Director General Yukiya Amano check the information and inspect the new sites that the Prime Minister revealed in his address to the UN General Assembly. The Prime Minister claimed Thursday that Iran is operating a secret facility in Tehran to store massive amounts of equipment and materiel from Iran’s secret nuclear weapons program. 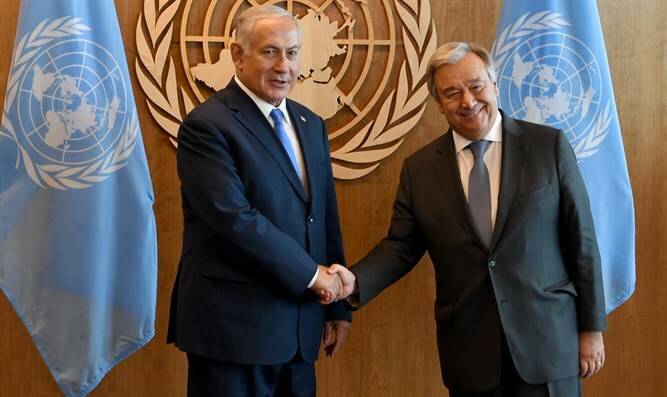 During his meeting with Guterres, Netanyahu also raised the issue of Israel’s captives and MIAs and said that the UN must do more to elicit additional international community pressure on Hamas to release them. The Prime Minister said the UN must act on the issue given the fact that it was the UN that mediated the ceasefire in the framework of which Hadar Goldin was abducted. The remains of two IDF soldiers killed in 2014 have been held by the Hamas terror group in Gaza since August 2014. Avera Mengistu, who is believed to still be alive, was taken captive by Hamas in September 2014. A year later, another Israeli citizen, Hisham al-Sayed, was taken captive after he crossed into the Strip.